ESE World is Europe‘s leading manufacturer of temporary storage solutions for waste and recycling materials, supporting its customers in optimising waste management and in achieving their recycling and sustainability targets, ESE is committed to providing innovative and sustainable products along with excellent customer service. ESE brings decades of experience and up to date know-how in product development having operated for over 80 years throughout Europe and in the UK in particular for over 25 years. With offices throughout Europe and a specialised worldwide export network ESE will find a solution for every requirement you may have. ESE has an extensive portfolio of products of relevance to the airport sector. In particular fill level monitoring systems and solar powered compacting litter bins which harness IoT technologies and allow airport operators to make huge savings in waste and recycling collection costs. 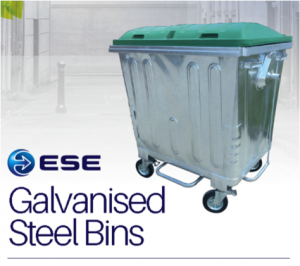 ESE also has a large range of public furnishings products including litter bins, with or without ashtrays, in plastic or steel, free standing or post mounted. We even have a range of office and airport bins. We can offer custom designs and finishes or corporate branding to suit the customer’s precise requirements. 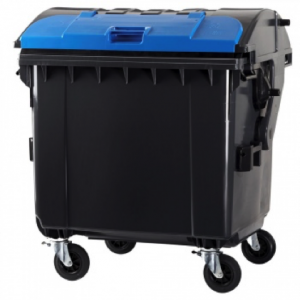 Our range of wheeled bins cover all sizes from 40L to 1100L and are manufactured with minimum 80% recycled material as certified by RAL “Blue Angel” making them the most environmentally friendly bins in the industry. We offer a bespoke customised container service at all of our sites including Coalville, Leicestershire and Nuenen, Netherlands and can also offer advice on container refurbishment and asset management. ESE also has strong local brands in Scandinavia, Germany, France and Italy. ESE’s products meet all international quality standards such as EN840, RAL and EN-ISO 14001:200. Compact your waste with solar energy and save up to 80% with Clean CUBE! Instead of dealing with multiple waste bins, with our solar powered compacting litter bins you could simply compact the waste so that it can hold up to 8 times that of standard litter bins. You can monitor real-time bin fill-level, bin status, and use the built-in analytics to optimise collection schedules and routes, only emptying bins that require emptying, saving time and fuel. Features a built-in, patented solar-powered compactor which triggers automatically based on the bin’s fill-level. 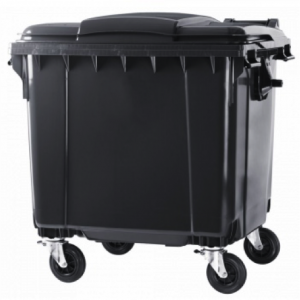 It’s compatible with standard 120L & 240L wheelie bins for easy and safe rubbish removal. There is even a 100L version. Communicates in real-time to a smart waste management platform, CCN. 2G and 3G telecommunication modules are available through GSM network. The compaction and fill-level information are sent to CCN, which not only helps the operation managers to understand the location and times of waste collections, but also improves the way they collect the rubbish by recommending the optimal collection routes based on real-time data and predictive analytics. The entire solar waste bin can be wrapped and printed for marketing purposes. What’s more, Clean CUBE solar-powered litter bins can have advertising panels, with or without LED backlights, to generate additional revenue. With LCD video screens you have the possibility of moving images for dynamic advertising. For indoor use we offer a hybrid AC/Solar version. CE mark – Clean CUBE solar waste bin complies with all relevant EU safety regulations. Safety sensor – built-in safety sensor detects motion and stops waste compaction when it detects an obstruction. Fire detection – bin’s temperature sensor triggers an automatic compacting response to extinguish fire. Locking mechanism – All exterior access points are fitted with anti-tamper screws. The CAMPUS GOOOL is the most sustainable solution for indoor pre-sorting of waste. The bin is completely recyclable, and it can be manufactured from up to 100% recycled material. Its high quality guarantees a long product life. This container makes the collection of various fractions more ergonomic and economic and improved separation of recyclable materials results in a higher recycling ratio. The classy design of the new CAMPUS GOOOL easily adapts to a stylish office environment, a modern airport lounge or passenger waiting room. A choice of material effects and special colours allows an individual look which can adapt to the surrounding interior design. Markings and labels on the cover and sides can also be adapted to the corresponding corporate branding. 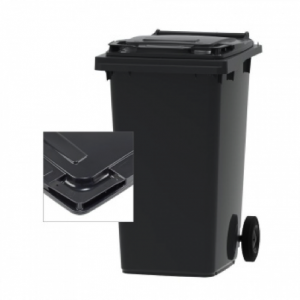 We have a comprehensive range of sizes with plastic wheeled bins from 40L up to 1100L mounted on 2, 4 or even 3 wheels. The 1100L comes in either flat lid, roll top or split lid. ESE has BEEN awarded the internationally acknowledged ecolabel, “The Blue Angel”. The environmental standards mark is the only independent label – worldwide – used to measure the eco-friendliness of plastic bins for waste and recyclables. Intended for the protection of people and the environment, it sets very exacting standards and has proven itself, over more than 35 years, as a guide for selecting environmentally-friendly products. Our containers fulfil all current European and national standards and they are certified in accordance with the highest quality standard worldwide, the RAL‑GZ951/1.